Last time we had reader Bill give us the inside scoop on how financial planning and assets under management (AUM) fees work at a typical fee-only firm (see AUM Fees and Financial Planning: The Odd Couple). Today I’m honored to have a well known financial advisor tell us how he works with clients under an Advice-Only model. Allan Roth is the founder and Managing Member of Wealth Logic, LLC, a Registered Investment Adviser firm in Colorado Springs, CO. He was CFO at billion-dollar companies before he became a financial advisor. His book How a Second Grader Beats Wall Street received great reviews. Allan frequently writes articles for or is quoted in Wall Street Journal, New York Times, Money magazine, AARP The Magazine, Financial Planning magazine, and other national publications. Unlike other financial advisor firms which take the size of their assets under management as a mark for success, Allan’s firm does not manage assets. He only charges hourly fees. That makes Allan’s firm an Advice-Only practice. I asked Allan for this interview. Allan did not charge me for his time nor pay me for writing this. Roughly 14 years, though I had been in corporate finance before then for more than 20 years. Did you operate under the hourly advice-only model since the beginning? Yes. I do have some institutional clients whose portfolios I review on a fixed fee basis. I’ve never used the percentage of assets or commission models. Why did you choose the hourly advice-only model? Commissions or AUM were never options for me. With rare exception, every profession on earth (even the oldest profession) is fee for service. I personally like the simplicity and transparency of such a model, and my clients like knowing exactly how much it will cost to get them to the right portfolio for their needs and goals. Once they get to that right, simple portfolio, it should take very little time to keep up. 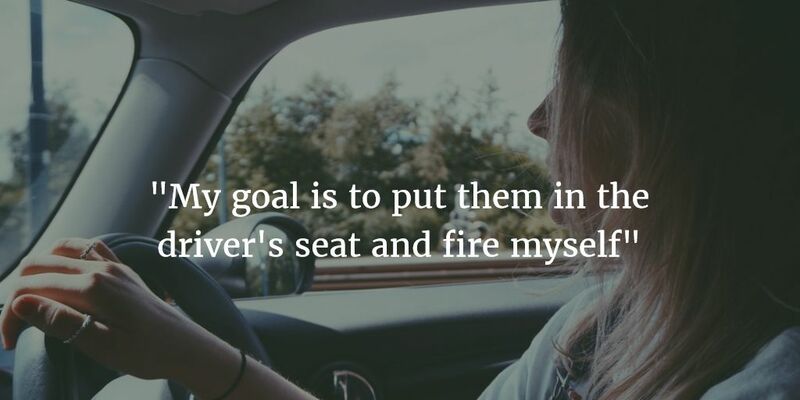 My goal is to put them in the driver’s seat and fire myself, since I know I don’t know what the stock market will do next year, what the hot companies or sectors will be, even whether intermediate-term rates will rise or fall. Recommend paying down a mortgage since it’s the inverse of a bond. Recommending any product I saw anywhere such as CDs with early withdrawal penalties directly with banks or credit unions. Recommend high quality fixed income as an AUM advisor might not recommend a bond fund yielding 2.3% if they were charging the client nearly half at 1%. Not have a conflict in a pension analysis and be more objective in whether a client should roll over their 401K to an IRA, as many 401Ks have great options such as Vanguard Institutional class funds or the TSP with the G fund (I wish I had access to). Most importantly, to be able to work toward simplicity since a client might not want to pay AUM for a simple portfolio. I think it’s important to “get real,” by which I mean inflation adjusted. A 50/50 portfolio might earn a long-run 2-3% real long-run return and, in my opinion, advisors don’t have a right to take a huge portion of that return every year. It’s the client who earned the money, not us advisors. Wouldn’t managing assets and charging AUM fees make more money for you? Though I’ve found my fee model to be quite financially gainful, there is no question that managing assets with the AUM model would create an ongoing revenue stream that would likely make at least 10 times the amount of income I currently make. And I could later sell my practice based on a recurring revenue stream whereas I can’t with my model. No model is completely conflict free, but I feel strongly that fee for service has the least. Admittedly, I had the luxury of choosing this model because, after a couple of decades in corporate finance and living frugally in a Bogleheads style, I was financially secure. As I tell clients, dying the richest person in the graveyard is a lousy goal. Had I started earlier when I was less financially secure, I probably would have chosen the AUM model. And if it meant putting food on the table or paying my son’s college tuition, I might have even tried to sell you an annuity that paid me a 10 percent commission. Roughly how many clients do you work with in a year? Are these clients mostly local to you or remote? The vast majority are remote whom I’ve never met in person. How do remote clients get over not being able to sit down face to face? I suspect many people don’t and never submit a profile, which I require before a meeting. The Internet and tools like Skype and Facetime actually allow a virtual face to face sit down. That I write for publications like The Wall Street Journal and AARP allows potential clients to get an idea of my philosophy and determine if it is a good fit for them. If it is, that makes them comfortable to a degree before we even talk. Did most clients have an advisor before they came to you or were you their first time working with an advisor? Yes – the vast majority have had or still have an advisor that is about to be let go. As I mentioned, my goal is also to be fired after the plan is implemented. How much of your time does a typical engagement take? It varies based on complexity. Though most engagements may average 12-15 hours, some are mind-numbingly complex and take more time, while others can be simple at about eight hours. Typically we have two meetings to go over two documents – preliminary recommendations (to make some decisions) and the final plan developed based on those decisions. The time required has virtually nothing to do with the size of the portfolio. For example, a client who sold his company for $20 million allowed me to create a simple plan as there were no tax-barriers to building the new plan. On the other hand, a $20,000 portfolio in 3 annuities has so much complexity that I can’t help on a cost effective basis, though occasionally I do some pro-bono work. You don’t really keep it a secret what kind of portfolio you recommend. Your motto is Dare To Be Dull. Clients can just Google “Allan Roth recommended portfolio” and see it right there. Why do they still spend several thousand dollars to receive dull? Building the right portfolio is the easy part. Getting out of the existing portfolio is the hard part. I’m in the business of helping clients through the complexities of reaching simplicity, or at least moving toward simplicity. Clients come to me with portfolios that have huge tax ramifications, and are not looking for a theoretically correct solution that has them recognizing huge gains paying capital gains tax, Medicare tax, and the AMT. Deciding how to get out and over what period of time is critical. They may also be in hedge funds or other private investments that take an analysis to make decisions. Finally, while building the new portfolio is much easier, taking into account forward tax efficiencies are critical, such as what tax wrappers are best for certain investments. I’ve always said investing is simple but taxes aren’t. I imagine investments and retirement are covered most often in your engagements. Is that correct? What else do you cover when you work with clients? Investments and retirement are the key areas but entail far more than selecting securities and calculating a safe spend rate. I’ll assist on a pension decision and analyze various non-security assets such as permanent insurance and other private investments. And the withdrawal strategies for tax-efficiency are critical including techniques such as multiple Roth conversions. I do review insurance needs and estate planning as well, though I’m not licensed to give legal advice and don’t sell any product. I often have to talk to the clients’ CPAs and attorneys to make sure my plan is consistent with their work. Vanguard had said when they were doing investment plans many clients didn’t actually implement the plan after they received it. That was one of the reasons they created their Personal Advisor Services that actually pulls the trigger for the clients. Do you know whether your clients actually follow through after they receive your recommendations? Yes. In the vast majority of cases I turn the client over to someone at Vanguard, Fidelity, or Schwab and they assist in implementing the plan, so the client doesn’t have to keep paying me $450 per hour. In many cases, there are snags along the way that require me to get involved. I will then follow up with the client on how implementation is going. I tell clients the plan is like a contract they’ve made with themselves that they must follow. Since there aren’t consequences for breaching an agreement with oneself, I imply that they’ll have to contend with my considerable guilting skills. What do you think are the reasons many Vanguard clients didn’t follow through but your clients did? I suspect one difference is that I charge a high fee for the plan and that’s a key motivator as few would like to pay thousands of dollars for a plan that won’t be implemented. When someone gets a plan for free (even a good one), I think they are less likely to implement it. A second reason is that, after my first analysis of their current situation, we talk over some decisions, such as asset allocation, use of certain products, tax strategies, etc. Thus, when I come up with the plan, the client is never surprised because it is consistent with their decisions. Do your clients come back to you for additional work after the initial engagement? How often and for what reasons? Many do, but only for specific reasons. For instance, they may want to decide what to do with substantial new money coming in from sources like selling their business or an inheritance. That can cause a dramatic change in the allocation. Others might just want a quick checkup. I explain to clients that a bad reason to come back is that markets have plunged and they want to pay my hourly rate to say stick to the plan and capitalism probably will survive. How do clients get over paying a large dollar amount up front versus a small percentage they don’t see over time? Even though it’s just an easy calculation to see that the small percentage adds up to many times the upfront fee, does the fee expressed in dollars right in front of them create an emotional barrier versus a percentage fee that gets deducted out of sight out of mind? It’s pretty easy. In nearly every plan I do, I show them the breakeven is well under one year. In other words, they save money the first year and much more in subsequent years. What do clients NOT get, that can be beneficial to them, when they work with an hourly Advice-Only financial advisor versus an advisor that manages their assets? My model isn’t for someone who doesn’t want to understand investing or even think about it. My model is only for someone who wants to go through the growing pains of developing a new portfolio and spend a couple hours a year managing it. Using me and an AUM advisor simultaneously typically doesn’t work, as my advice would conflict with the AUM advisor. I do have a free monthly newsletter which clients and non-clients alike can subscribe to and see my latest thinking based on articles I write. They can subscribe at http://DareToBeDull.com. What about DFA funds? Your clients are not able to invest in DFA Funds because you don’t manage assets. I see someone often posts on Twitter superior performance of DFA funds. Are your clients missing out? DFA is one of the good guys. I’m especially impressed by the fact that they told me (for an article) that they don’t believe their factor tilting is a free lunch and do believe in efficient markets. Another way of doing factor tilting is “smart beta,” but I believe if one wants any factor tilting at all, one can, for example, do it with lower costs and more tax-efficiency by supplementing a total stock fund with a small cap value fund. I bought some DFA funds over a dozen years ago. My experience is that they were less tax-efficient than I had hoped. I’ve decreased my DFA holdings over time and today have no more than about 2% of my holdings at DFA with the majority at Vanguard. As an advisor, I don’t have to pay myself to own DFA. That shows that I think Vanguard is superior so my clients aren’t missing out. Why don’t more people seek advice-only? People don’t like pain, and the hourly model yields the highest degree of it as far as paying. I send an invoice after the plan and the client has to send a check. This causes the maximum amount of pain due to its transparency. Conversely, the AUM and commission models are relatively pain free as transparency is less and people typically have little idea of how much they are paying. In my opinion, people should feel the pain of paying through transparency. Also, in my opinion, no industry is better at making fees non-transparent and painless than the financial services industry. What can be done to make advice-only the norm as opposed to the rare exception as it is today? A couple of years ago, I asked Vanguard CEO Bill McNabb if he thought the hourly model would gain traction. He responded that it took a long time for the industry to transition from commission to the percentage of assets model and another transition soon was unlikely. Unfortunately, I agree with him. People don’t know how much they are paying and they don’t know their investment performance against the correct benchmarks. Thus, they don’t do a cost-benefit analysis. I suspect the only way an advice-only model would take off is if laws were passed requiring that statements had to show total annual fees (fund fees, AUM, wrap fees, and other) as well as performance against standard broad benchmarks of total returns, including dividend reinvestment. That’s unlikely to happen in my lifetime. Sorry to end on a downer. I’m more optimistic about the prospect of Advice-Only than Allan Roth, although I agree making it illegal to automatically deduct advisor fees from clients’ accounts would be a great push for more transparency. The more I think about it, the more I see the parallel between index funds and Advice-Only. John Bogle gave up the potential to earn at least 10 times more when he started index funds. Investors kept the difference. Allan Roth gave up the potential to earn at least 10 times more when he chose hourly Advice-Only. His clients kept the difference. Slowly but surely people started rejecting actively managed funds. It’s only a matter of time that people will reject AUM and demand Advice-Only. I don’t have to change the world. I’m happy to help one person at a time in moving to Advice-Only.